NOTE: If you haven’t yet registered, you must complete your vendor profile application first. When you’re in the product view, select “Bookings” under the Product Data section. Click on “Add disabled date”. Day: This will disable a certain day of the week so that clients will see it grayed out. Ex. Disable all Wednesdays. That means all rentals will need to end on Tuesday and cannot start till Thursday. Date: This will disable a specific date. Ex. You’re out of town on January 1 and you don’t want any rentals to be out during that day. Date Range: This will disable a range of dates: Ex. You’re going on vacation for a week and can’t have orders during that time. Can also be used if a product needs maintenance and cannot be rented out for a while. Important: Don’t forget to click “Update” in the Publish section. 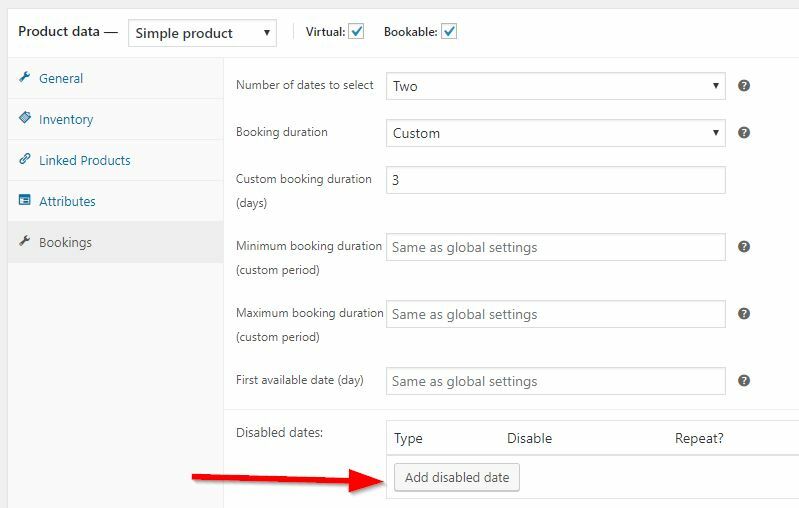 If you need to cancel a disabled date, you can click on the “X” to the right of the date.